Graphics processing unit pioneer Nvidia has made VC investments around the globe to build an artificial intelligence ecosystem. As Nvidia Corp. (NVDA - Get Report) looks to extend its lead in the technology underpinning many artificial intelligence applications, the company is drawing from the playbook it used to develop a gaming GPU powerhouse. "We've always had a very large number of people working with the game developer community, and actually tuning and improving the games that run on our platform," said vice president of business development Jeff Herbst. "Now we're doing the same thing with A.I. companies, with high performance computing companies, with auto and self-driving car companies." Nvidia provides startups deploying its GPUs in strategic niches with support ranging from discounts on hardware and training to publicity and capital from Nvidia's GPU Ventures unit, which has 20 to 30 active VC investments. "You can't just offer a piece of technology and expect people to figure out how to use it," he said. "You have to train developers. You have to educate students in universities. You have to nurture startups." While GPU Ventures wants positive financial outcomes, Herbst said the main interest is to make strategic investments that promote the ecosystem of companies that use its GPU technologies. The investments fall into three main categories. The first is autonomous vehicles, with Nvidia backing companies such as JingChi Inc. of Beijing. Boston's Optimus Ride Inc. and Beijing-based TuSimple LLC. Second is data analytics, including investments in Austin, Texas, data-crunching technology developer BlazingDB, Oakland, Calif., data visualization company Graphistry and Mountain View, Calif., artificial intelligence platform developer H2O.ai. Third is deep learning. Investments include Zebra Medical Vision LLC, a company in Israel that uses imaging technology to help radiologists diagnosis conditions; Israeli cybersecurity firm Deep Instinct LLC; Tokyo-based retail analytics systems developer ABEJA Inc; and Silicon Valley autonomous drone technology company Skydio Inc.
"We may look back in three or four years and say there really is no such thing as an A.I. company," Herbst said. "A.I. is just an underlying technology or an underlying platform that allows companies to exploit a particular vertical." 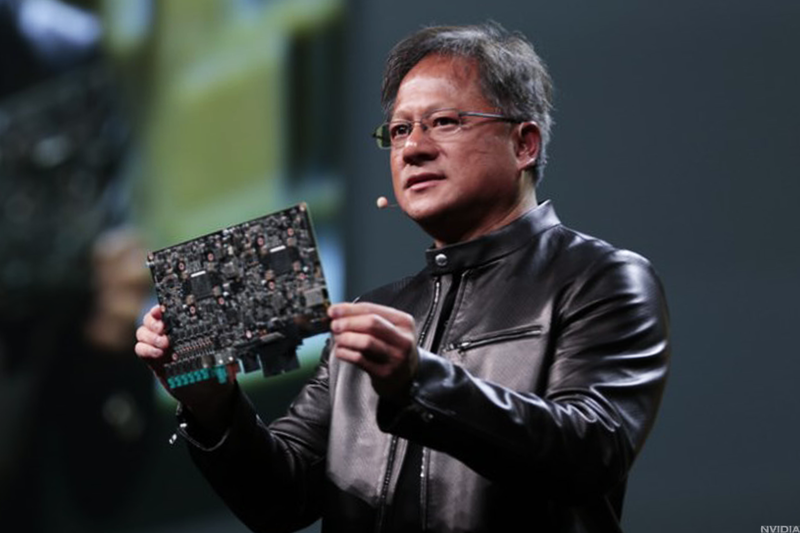 Nvidia's GPUs are the dominant architecture for artificial intelligence, though it has rivals. Intel Corp. (INTC - Get Report) has acquired Nervana Systems Inc., Movidius Inc. and MobileEye NV to improve its A.I. capabilities. During a recent investor call, Credit Suisse analyst John Pitzer said there is a debate about whether another architecture such as a field-programmable gate arrays, or FPGA, or application-specific integrated circuits, or ASICs, might rival the GPU. He noted that venture capital money has recently flowed into Graphcore Ltd., which raised $50 million led by Sequoia Capital, and Cerebras Systems, which reportedly obtained $25 million from investors including Benchmark Capital earlier this year. "It would incredibly bad news and incredibly surprising if there were nobody else in the world who was trying to build an architecture to come and do this," Herbst said. "That would mean the market is not that big." Nvidia has been building on its GPU technology since the late 1990s. Revenues and profits that come from gaming and other GPU businesses funded the expansion of the development of its A.I. efforts. Development of the CUDA computing architecture that allows developers to use GPS for non-gaming, high-performance applications, he added. "At least half of our engineers at Nvidia work on software," he said. "That's something the world in general may not understand because it's really easy to label us a chip company and put us in the chip category." Cultivating more developers through GPU Ventures will be an important part of Nvida's A.I. playbook. "A platform is of no use to people without applications that run on it," Herbst said.